With grocery store shelves being cleared ahead of Irma's expected landfall in the United States this weekend, Floridians trying to wrangle important supplies ahead of the Category 5 storm have turned to Amazon. There's just one problem: Prices for bottled water have skyrocketed, leading outraged Floridians to levy charges of price gouging. A screenshot posted on Twitter showed a pack of 24-pack of Ice Mountain bottled water going for $99.99. But that wasn't the only example. 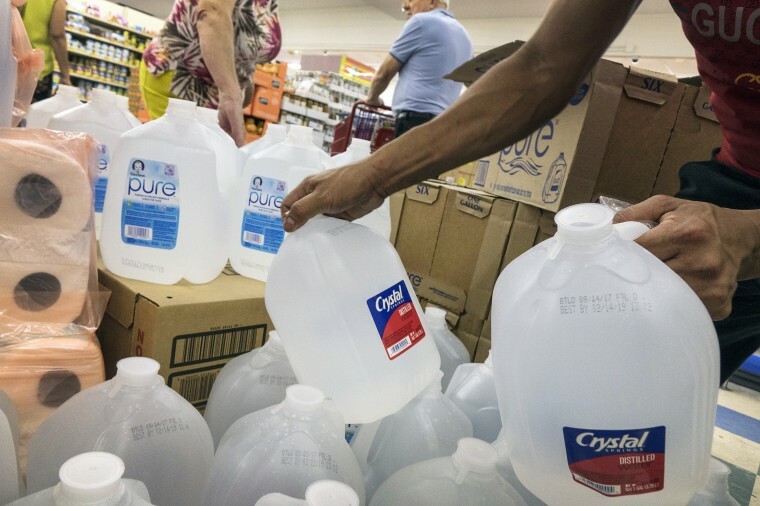 Other Twitter users shared screenshots of a $63 jug of water and cases of water going for $30 to $40 — three to four times the usual price. An Amazon representative told NBC News in a statement that the company does not "engage in surge pricing and product prices do not fluctuate by region or delivery location." "We are actively monitoring our website and removing offers on bottled water that substantially exceed the recent average sales price. Prices have not widely fluctuated in the last month. Lower priced offers are quickly selling out, leaving higher priced offers from third party sellers," the representative said. If Amazon customers see a product that has "substantially increased in price," the representative said they can contact Amazon customer service to investigate and if warranted, they'll take appropriate action. The examples shared on Twitter were from third-party vendors. Price gouging to capitalize on an emergency is against the law in Florida. "The law compares the reported price of the commodity or service during the state of emergency to the average price charged over the 30-day period prior to the declared state of emergency. If there is a 'gross disparity' between the prior price and the current charge, it is considered price gouging," according to the Florida Attorney General Pam Bondi's website. Meanwhile, with store shelves being emptied, Amazon is hoping to help connect people with the essentials they'll need ahead of the storm. Amazon has been promoting a "storm readiness" section on its Prime Now site, offering residents in south Florida two hour delivery on essentials such as batteries, flashlights, snacks, and bottled water, with the caveat that there would be limited supplies.